Just go to the previous post and you'll see the various ways you can enter to win it. Ends Feb 14th. And don't forget to go to Grow Your Blog - you will have lots of fun there. The prairie points aren't that hard. You can see a tutorial for these peiced points in my previous post. It's just finding the time to do them. I've been creating another B3quilt for my guild and in the process made 4 more (some for St. Anne's). LOL - I couldn't stop! How did you do with your WIP progress? I'd so like to see what you did - even if it was only a little bit. Linky below. It ends Monday, midnight. So looking forward to seeing your steps forward. Here's my finish for the week. One of those 4 I mentioned. Now how can a quilt top be a finish? That's my part of the process for St. Anne's . I make quilt tops; others sandwich, tie and bind. Sometimes I will quilt a top, but most are tied. I'm linking to Amanda's Finish it Up Friday, Sarah's Can I get a Whoop, Whoop? and Julie's Pet Project Show. See you there! 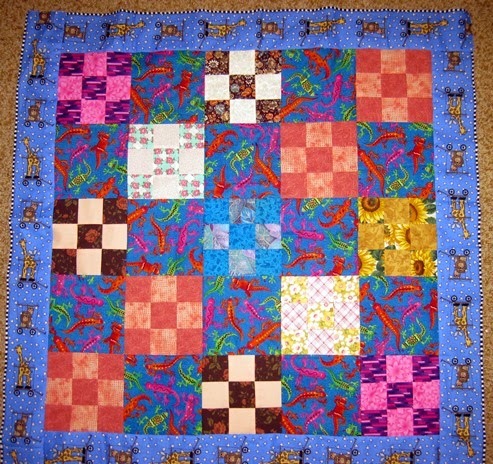 Your prairie points border looks so nice on the quilt - I'm planning on trying out your technique one of these days. I don't think I've ever seen prairie points made the way you did in your tutorial. I made prairie points one time in separate pieces and had a hard time lining them all up accurately. I'll have to try your method if I ever think of doing points again. Love 9-patches! I too have a flimsy finish using them, too funny. Must check out the WIPS Be Gone linky. I read your prairie points post the other day and think I understand but I can't wait to see your finished quilt to see what it looks like. Thanks for hosting this party too! Almost all my finishes are tops because they go off to American Heroes. If I had a longarm, a finish would be quilted but not bound - I hate binding! Your donation to St. Anne's is adorable! Your prarie points are looking just gorgeous! Congratulations on your finish!